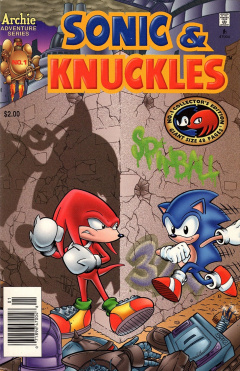 Sonic and Knuckles is the second speciality 48 page issue of the Sonic the Hedgehog comic series. It was released in August 1995 and takes place after issue 24. This comic features three stories: Panic in the Sky, Fire Drill, and Lord of the Floating Island. The western coast of the main continent of Mobius is one of the only areas of the planet untouched by conflict with Robotnik. There, Mobians can frolic without worry of roboticization, until now. A large floating island appears over the western coast, alarming the denizens. They all run and hide in panic due to the unknown landmass floating over their homes. It passes over them, and continues on into the continent. In Knothole Village, the Freedom Fighters, minus Sonic and Tails are tracking the progress of the floating island as it makes its way inland...toward Knothole. Sonic and Tails eventually join in, and recognize the floating island instantly on the display. Sally Acorn asks them how they already know about the island, as they recall their journey to it (from issue 13), meeting up with Knuckles the Echidna, the Chaos Emeralds keeping it afloat, and how they became friends. From the details of their initial contact, Sally is curious as to the actual side that Knuckles is on. She decides that they should assume the worse, ordering Tails and Sonic to join Antoine in their plane to investigate the island. The group arrive at the floating island, astonishing Antoine due to the size of it. To their surprise, the island now has some new weapons emplacements, as heavy artillery appears from under the island and fires on the plane. Not only that, but Sonic also notices that engines have been placed on the island. They head top-side to investigate on the island itself. Both Sonic and Tails jump out of the plane, while Antoine takes the plane back to Knothole. Tails glides down with his tails, while Sonic uses a parachute to slow his descent onto the island. Although unsure as to where to start, the duo decide to walk along to see what they can find, or if something can find them. From behind a bush, a figure watches the two suspiciously. As they continue on, they arrive in Mushroom Hill, a forest full of giant mushrooms. Suddenly, from above, a hand-operated elevator arm falls on Sonic, knocking him out for a bit. While out of the loop, Sonic thinks that all the mushrooms around him are preparing to eat him. He shakes out of his daze, realizing he was only thinking of the live mushrooms, as Tails points that he was knocked out by a hand-operated elevator (or pendulum, as stated). He decides to grab one of the elevator handles to pump his way up, while Tails flies up, and reaches the top of the forest. He then uses the top of the mushrooms to bounce to the edge of the forest, where he meets up with Hey Ho. It swings at Sonic with its axe, nearly chopping his head off. It continues to swing its axe, destroying trees, but missing Sonic. He jumps up, avoiding the axe swings, and hits the machine's back, destroying it. With that machine out of the way, the duo continue on a path to find out the mystery of the floating island. Sonic runs over a slick of mud that sends him into a pit. On the way down the pit, he grabs a ledge. He looks up as he sees a mysterious figure...Knuckles! Sonic pokes up to see his prior acquaintance, but Knuckles is not as happy as Sonic is to see each other. Annoyed with trespassers, Knuckles declares that this is Sonic's second offence, and prepares to step on his hands on the ledge. Before he can, he looks up as he hears Tails, who throws a boulder down at him. Knuckles jumps out of the way, into the pit, sending him and Sonic plummeting to the bottom, while Tails can only watch. The two foes fight each other on the trip down, until they exit in a lava-filled area on a floating rock slab. Knuckles prepares to punch Sonic, until the slab starts becoming unstable. It starts to sink, just as Tails catches up and grabs the duo. He then takes them up to the surface through a hole in the cavern roof. Although thankful for the assistance, Knuckles still claims his obligation to protecting the island from intruders. Sonic interrupts by pointing to the sky, stating they aren't the problem. Knuckles looks at the clear night sky, realizing that the stars are all in the wrong position than they should. The island has been hijacked, and outfitted with weapons and engines, all under Knuckles' nose. He makes a truce with the two and opens up a tunnel in the ground to the Chaos Emerald chamber. They arrive in the chamber, which uses the Chaos Emerald to keep the island afloat. The room, however, has been outfitted with a Chaos Syphon, which draws energy from the emerald. Knuckles touches the energy being syphoned, only to be shocked. From a wall on the side of the room, a holographic image of Robotnik appears, and proceeds to tell his story of what he has done to the island. For months, he had prepared plans to convert the floating island to his own battleship. Using his technology, he attached an engine, weapons, a syphon, and his own command center into the heart of the island, all under Knuckles' radar. Over Knothole, Robotnik plans to use the weapons on the island to disintegrate the village. As Knuckles had distracted Sonic and Tails, Robotnik had enough time to get the island in position and is ready to fire. With the lives of many on his shoulders, Knuckles blames himself, and decides to take matters into his own hands. He takes the emerald out of its holder, as Robotnik helplessly watches in surprise, then punches it, shattering the crystal into many shards. With the emerald destroyed, there is no power source for the island, sending it into a fall. Robotnik aborts his mission, ejecting his command module from the island. With the island right over Knothole, Robotnik realizes he doesn't have to do anything, as the plummeting island will destroy the village. Back in the chaos chamber, Knuckles asks Sonic if Robotnik has left. As he notes so, Knuckles opens a panel in the floor, revealing a spare Chaos Emerald. He puts it in to emerald slot, stabilizing the island right over the village. With Robotnik's threat gone, for now, Knuckles leads Sonic and Tails to the surface so they can return home. Tails commends Knuckles for having a spare, but he notes that there never was a spare. The one he destroyed was a fake, that he switched with the real one while Sonic and Robotnik weren't watching. With Knuckles as an ally again, Sonic offers him an invitation to park the island and join their cause against Robotnik. However, Knuckles has his own problems and responsibilities, denying the invitation. With that said, Tails takes Sonic and leads him down to the surface as Knuckles waves goodbye. As they arrive on the surface, the other Freedom Fighters catch up to check on them, and on Knuckles. Sally asks if he'll ever join their cause. Sonic knows that Knuckles works on his own, as the island floats away from the continent. It is a quiet day on Knuckles' floating island, until a large explosion occurs near Mushroom Hill. Sensing trouble, Knuckles jumps up and glides over to the source of trouble. He arrives at a beach on the island, only noticing a crater at the location of the explosion. He glides down and analyzes the crater, noticing a series of footprints. Scoffing at the intruder's lack of stealth, he follows the footprints to a nearby bush. He leaps into the bush, but finds nobody. He looks over, realizing that the intruder may have gone into the ruins of Sandopolis Zone. Based on the distance from the beach to Sandopolis, Knuckles realizes he's dealing with somebody fast: Sonic the Hedgehog. He lands at the entrance to the ruins, yelling out to the intruder, whom he presumes is Sonic, to come out and face him. With no response, he reluctantly enters the dark ruins. From above, the intruder activates a trap, sending a whole series of rocks plummeting in Knuckles' area. He jumps out of the way, getting angrier as time goes on, thus he continues his journey into the ruins. Going around a corner in the ruins, Knuckles keeps calling out to his intruder to appear, and to taunt them. To his surprise, an axe appears out of a wall and nearly chops him. He jumps on the nearby wall to avoid it, then looks toward where the axe came from, noticing a door. He enters it, presuming it is the only place the intruder could've went. As he enters the room, he looks around as he sees a corridor with many colored blocks, wishing his father had told him more about the area. While in the middle of wondering where he is, a ton of sand starts falling on him. He runs away, to prevent himself from going blind from the sand, and punches through a wall to escape. To his surprise, he arrives outside the ruins and notices the footprints again, leading far away into the distance. He jumps up and glides along the footpath. The footprint path leads to the edge of the island, making Knuckles believe more that the intruder is Sonic. He calls out from the edge of island to Sonic. Unknown to him, from behind in a bush, a being watches. To himself, the being notes that this was Knuckles' first lesson...and that many more are to come. Knuckles is flying around his floating island, despite there being a heavy wind. He looks down, noticing he's not the only one with problems: a baby kangaroo has lost its mother. He glides down and picks up the kangaroo, who is upset at losing its mother. With the heavy winds, and the baby kangaroo at hand, he is unable to glide, so he must help the baby on foot. He puts the kangaroo on the ground and introduces himself as Knuckles, who the kangaroo is aware of. The kangaroo tells him that his mother has told him all about Knuckles, and how he is the protector of the floating island. As a protector, he asks Knuckles to stop the storm and clear the sky from its darkness. He points to the sun, which has been blocked by the moon. Knuckles goes on the explain what is going on from what his father told him. Over Mobius, the moon occasionally aligns between Mobius and the moon, creating a temporary darkness. However, since the island floats along air currents, the current strong winds confuse even him. The two then hear a loud noise coming. Knuckles picks up the baby and glides out of the way, as a whole herd of dingoes stampede through the area. Something is upsetting the dingoes, as they are running off to hide somewhere. The two, from a tree, hop down as Knuckles explains about the paradise nature of the island, despite the recent visits from Robotnik and Sonic. Suddenly, the winds really start to pick up. The kangaroo holds onto Knuckles in fear. It all comes together, as Knuckles looks on to see the eclipse ending, with the winds dying down until the sun fully appears, ending the wind storm. From a bush nearby, the kangaroo's mother hops out to be reunited with her son, who is named Benjy. She thanks Knuckles for his help. He flies away, confident in his skills to protect and serve his island. The cover features many nods toward Sonic games and hardware, including Spinball/32X spraypainted on the wall, and a Sega Mega Drive in the pile of Swatbots, along with a Sega Saturn. This special issue ties into Sonic & Knuckles, hence the title. Sally's Freedom Fighters, Hamlin, Arlo, Penelope and Dylan, are some of the citizens on the western coast of the continent. The emerald used to keep the island afloat is called a Chaos Emerald in this issue, although the actual name of it is the Master Emerald. It remains the small size shown in this issue until later on in the series. Knuckles' father is mentioned for the first time in Fire Drill. This starts a long story arc that continues in Sonic Triple Trouble, Knuckles' Chaotix, 6 issues of the main Sonic the Hedgehog series (issue 31 - 36), and cumulating in the Knuckles the Echidna mini-series. This page was last edited on 28 March 2019, at 17:33.